A Status Orange weather warning for is in effect for Donegal, with a Status Yellow wind warning in place for the rest of the country as Storm Erik tracks across the country with wind gusts of up to 120km/h. Met Éireann has said wind speeds are set to average between 65-80km/h in affected areas, with gusts hitting up to 130km/h, adding that there will be stormy conditions for a time in western and northern coastal counties. The warning for Donegal is valid until 6am tomorrow. A Status Yellow wind warning is in place for all other counties until the same time in the morning. There are no reports of any major issues as a result of high winds in the west. 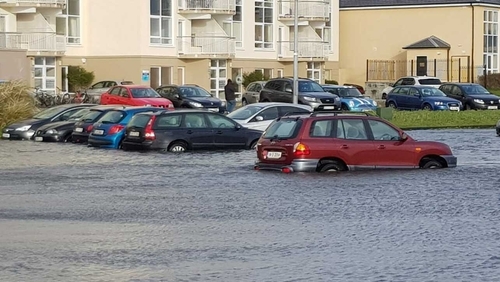 Gusts of 120km/h were recorded at Mace Head in Connemara, and high tides and storm surges have resulted in some coastal flooding along the promenade in Salthill. The Toft Car Park on Seapoint Promenade is underwater and a number of cars parked there have been flooded. Traffic restrictions on the main route westwards through Salthill were lifted after this morning's high tide. Elsewhere, high tides in north Mayo led to flooding on the Belmullet to Blacksod road earlier today. Gardaí say the waters have receded slightly and the route is now passable with care. However, they are advising motorists that strong winds have knocked some power lines in the area and that they should remain vigilant for the risk they pose. Th ESB can be contacted at 1850 372 999 if a disruption to service needs to be reported. Meanwhile, the Irish Coast Guard is assisting two fishing vessels, including one with 91 people on board, impacted by Storm Erik off the coast of Ireland. An Irish fishing vessel sustained major damage after being struck by a very large wave 120 miles west of Dingle. It is making its way towards an Irish port. None of the crew were injured. The second vessel, a Russian trawler with 91 people on board, reported mechanical damage due to the storm at around 7am. The trawler is one of about 20 working in an area about 220 miles southwest of Dingle. Speaking on RTÉ's News at One, Derek Flanagan, Divisional controller for West and Northwest for the Irish Coast Guard, said "they lost engine power and are currently adrift with 91 people in very high seas, about 10m seas. "We are waiting for the weather to abate so another vessel can tow them into port and sort out their engine problem," Mr Flanagan said. Mr Flanagan said with high, rough seas the coastguard is concerned about "the increased likelihood of injury to crews working on board as they try to contend with those weather conditions." He added that the 20 or so trawlers working in the same area as the Russian boat "decided that they were going to work through that weather." "They know this is a relatively fast travelling storm and they will normally ride out the conditions until it improves and start fishing again," he said.